(I know, I know. Excel isn’t a database.) 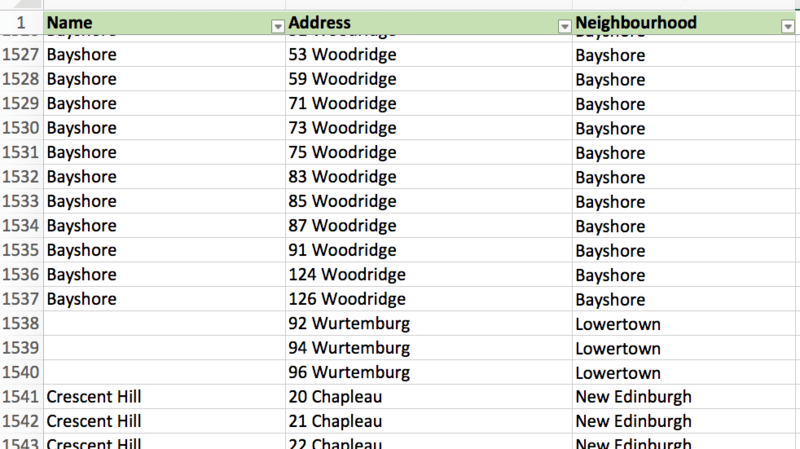 Every once in a while, I decide to spend too much time transcribing information from the city directory into a spreadsheet. When you’re first getting into urban history, the city directory is one of the more revelatory and interesting sources of information about the past you first encounter. Many libraries have a shelf’s worth of them in the reference section and when you’re trying to answer questions like “what was there in 1932” and “who lived at 263 Nutella Lane in 1975” they’re an indispensable source. Moreover, depending on which company published the guide, you may even have access online.1Those of us who were covered by the Might’s directories are SOL, but if you’re keen on, for example, digging into this source in Montréal, then the BANQ has you covered, having digitized Lovell’s Directory for an impressive 150 year run. That level of convenience makes them a perennial favourite for urban historians working in an academic setting,2I learned about them from Carleton’s John Taylor when I took his urban history course in 2002. in the private sector, and at home. For the longest time, Might’s could do little, if anything, wrong. Generally, whatever I was looking for in its rapidly-disintegrating pages was easily found and I was happy. At least until I decided that I’d like to go beyond collecting little nuggets and doing more with the information collectively. I’m no Quantevangelist,3I’ve abandoned fields due to an over-reliance on economic-indicators-as-ultimate-truth. but numbers do matter. Although when you begin to work with numbers, the weaknesses inherent in either the approach taken or business model used by the publishers of these directories are made quite plain. While I’m always happy to get to a higher level of accuracy, I was arguably more pleased when I was less aware. Right after the antique dealers in the classified section, you could find apartment buildings. Source: Might’s Directory of the City of Ottawa, 1965. It began in the late 1920s. The Toronto-based Might Directories was the producer of Ottawa’s directory and as they became a more common and expected feature in the city, the producer began to collect apartment buildings into a separate list at the front, between Antique Dealers and Architects. For someone like myself, who has long been interested in studying apartment buildings, this section has been a real boon. I had always used the lists to find individual buildings, but this March, I decided to use the whole thing. After having transcribed the 1945 list, I was pretty satisfied with what I had done. 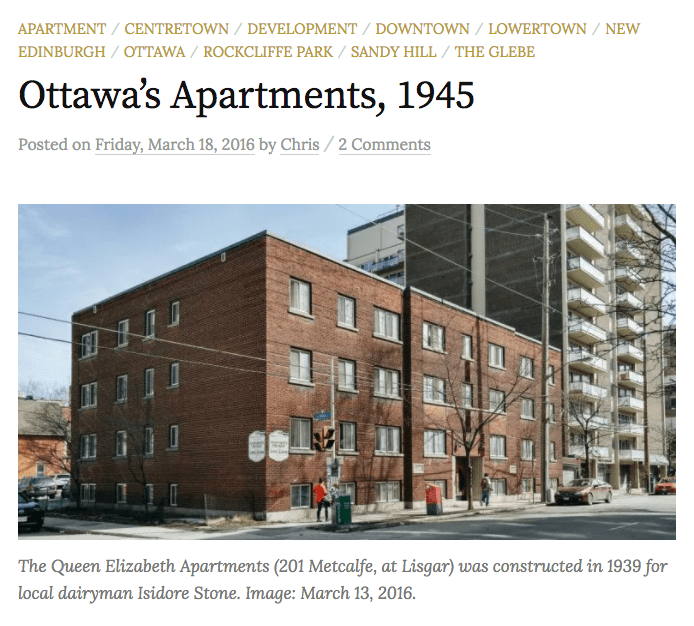 Available here on Margins was, afterall, a comprehensive, sortable, and searchable list of apartment buildings in Ottawa that year. A few months later, I did the same for the 1955 list. Regardless of errors and omissions, the street directory is a rich source. Source: Might’s 1923. Now, I’ll note that I’ve always known that the city directories contain inaccuracies. Although information was collected in a variety of ways to compile them, canvassing was the core method. Having used them long enough, you can’t help but trip over a few errors here and there. What doesn’t tend to show up when you use them for spot reference is just how many of these errors, inconsistencies, and omissions show up. That seems to go double for when you’re looking to classify things. Getting more to the point, after having transcribed thousands of apartment buildings, there are a few things that become clear. Isaac Levine’s small 7-building Crescent Hill cluster development never did make Might’s cut for the list of apartments, but did get listed in the street directory. Image: Google Maps. As noted above, apartment buildings are listed in two places. The first is in their own list near the front of the directory and the second is in the street directory. 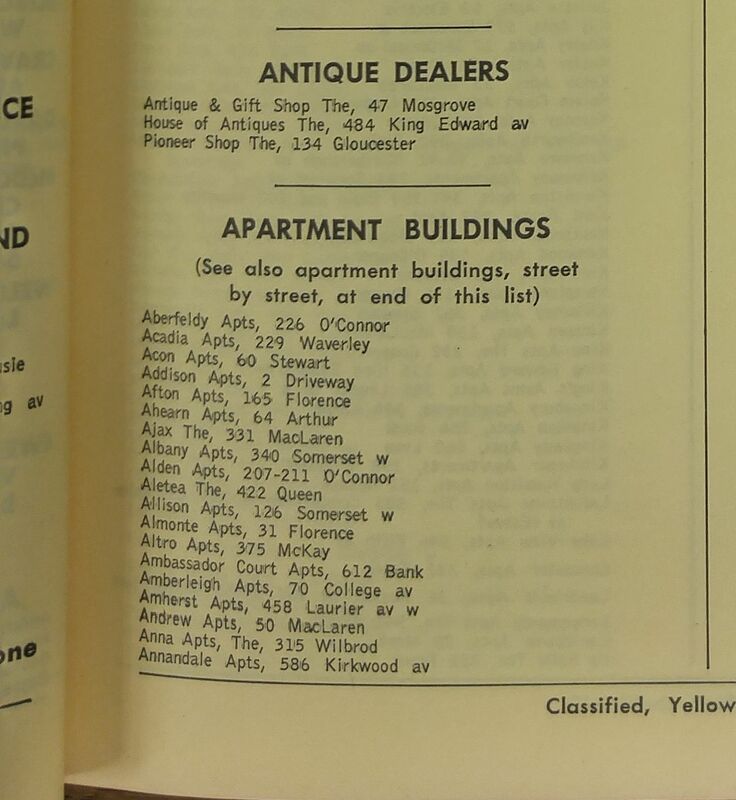 Buildings identified as apartments in the street directory may not make it into the list near the front. I’ve never got the impression that this was deliberate or part of some system, though I would be happy to learn that Might had, in actuality, some method to its madness. It’s not entirely clear that Might necessarily even had a clear definition of what constituted an apartment. A number of triplexes are included in the apartment list at the front, but not a large number relative to the amount listed in the street directory. Though they are not prioritized, it’s clear that they do qualify for the front list. For my own purposes, I tend to operate on three principles: (a) it was either built or operates as one (ie. wholly separate units),4Which only makes rooming houses more of an issue. So I’m no prize either., (b) while the owner may live on the premises, that is not a requirement or even normally the case, and (c) there are at least three units.5All lines are arbitrary, of course. There are a large number of two-unit apartments in the city, though at that point, you’re getting into a semantic argument. What separates two-unit apartment from a semi-detached home? Tenure? What happens when one side or level is owned and one is rented? There are different understandings that come from a building’s form. 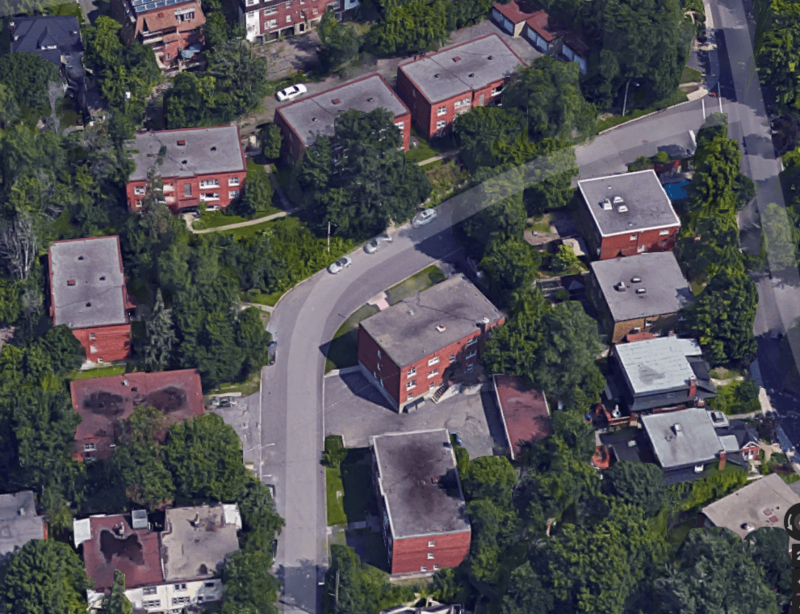 For example, a purpose-built triplex like the ones on Dagmar above will have a considerably different feel and communicate a very different meaning than three units in a large converted Centretown home will. This is all to say nothing about the back-to-back-with-a-common-hallway townhouses that began to appear in the 1960s and were, along with many garden homes, classified by Might’s as an apartment. Once I get to the 1975 list, the tower condominium will become an issue to wrestle with and I will have to make a call on housing tenure. When I was working on the 1955 list earlier this year, I went back into the street directory to locate six-plex apartments that were missing from the front list. That size of apartment seemed manageable and fit with my interest in that era’s cluster development approach to apartment building. Fast forward a decade and while it’s clear that the clusters continued to pop up, beginning in 1959 or so, the story really came to be about the midrise and highrise apartment.6By the standards of the day, of course. We’re looking at 7-12 storey buildings. Nonetheless, after having felt the need to go back into the street directories for 1955, I did so too for 1965. Brittany Drive Apartments, 1965. Although towers, they did not make it into the list of apartments that year, though were in the street directory. Image: geoOttawa. Brittany Drive Apartments, 2015. Image: Google Maps. Due to the size of the directory and time constraints, I scoured the streets beginning with A and B, looking for all residential properties with at least three separate identified units (ie. 1, 2, 3 or A, B, C). In short, while I’ll need much more research to draw any definite conclusions, I was able to locate 174 buildings that were not captured by the list of apartments.7Nor where they found on my visual inspection of the 1965 aerials, and there were a rather large number of apartments that I located in the 1955 street directory that never did make it into the 1965 list of apartments. To be certain, not all of these would be considered apartment buildings, though I’d be happy to wager that the majority would be understood as such. Now more commercial, 1883, 1889, 1897, 1901, 1907, 1911, and 1915 Baseline begun life as residential triplexes. Image: Google Maps. Although there are a number of examples closer to the core, the further geographically that the Might’s enumerators strayed from the already-existing list of apartments (and therefore further from the downtown), the spottier and more inconsistent their list becomes. Some cluster developments make the cut, while others don’t. Whether or not they were named and marketed heavily does not appear to make a difference. I’ve even found the occasional example where one apartment of a large cluster was listed, but none of the others, regardless of whether or not they had a civic address. A trio of triplexes on Dagmar Avenue in Vanier. Image: Google Maps, May 2016. Although the street directory itself is arguably much more complete, it too has a few issues. One of the main ones I’ve come across most frequently is just what to do with smaller apartments? Take the triplex for example. They sprouted in Vanier like mushrooms after the rain in the midcentury period. They were simple, inexpensive to construct, and Vanier had, well, a less stringent building code so they were a popular choice for the municipality’s small investors. Those three triplexes were present and complete in 1965, although they were not listed among the apartments in the dedicated apartment section. They do appear in the street directory, however. Image: geoOttawa. How to classify them though. Looking through the pages of the directory, there were some triplexes that made it into the apartment list, some that remained in the street directory, but identified as an apartment, and still others were only identified by having three (or more) units listed under the civic address. There were a number of instances in which no discrete units were identified, although three or more adults with different surnames were resident. Of course, even in 1965, there were a large number of families and single adults who were doubled/tripled up in a single place, so making the call would require a bit of investigation. And again, I acknowledge that my own definition falls down on the topic of the rooming house or SRO. Moreover, without more in-depth research, it may not be clear whether or not Might Directories counted rooming houses in the list of apartments. Thus, it would seem that when directories are most useful, in the absence of other sources, their accuracy cannot be determined.8Gareth Shaw. “Directories as sources in urban history: a review of British and Canadian material,” Urban History, Vol. 11 (May 1984): 40. Had the directory been the only way to approach this, I’d be either none the wiser or would be secure in knowing that I could just settle for “best we have”. Unfortunately for my sanity and fortunately for accuracy, as starved as we are for sources, we now have access to so much more. The Ottawa Journal has been a great one. News sources have their own issues. Nevertheless, triangulation. Source: Ottawa Journal, July 14, 1955, p. 1. Since I’ve yet to fully organize my thoughts about this and have nevertheless gone on at length, I’ll just wrap up. City directories, while highly useful and unquestionably one of the best sources we have to understand much of the urban fabric’s makeup, are but one source. When making use of them, it’s always good to make use of other information, both as a check, and to triangulate. 1. 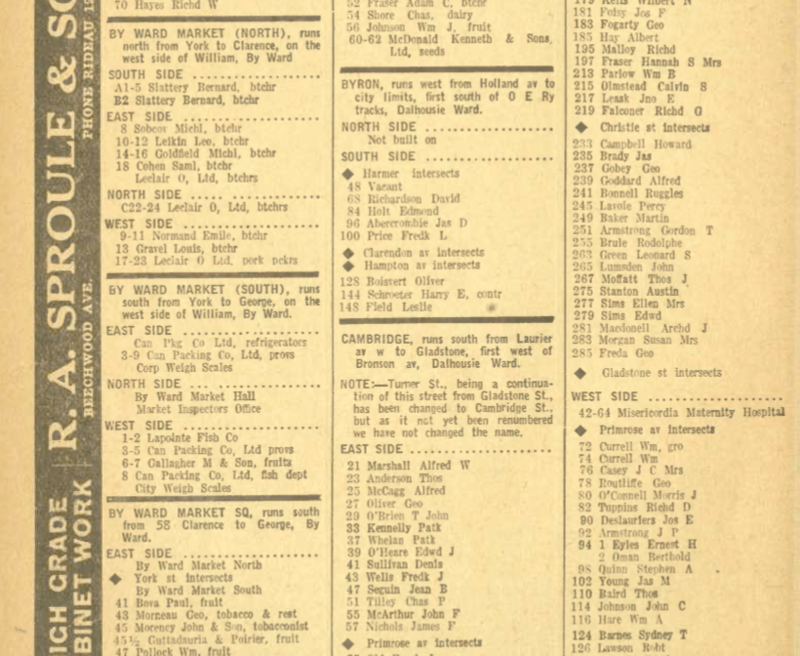 ↥ Those of us who were covered by the Might’s directories are SOL, but if you’re keen on, for example, digging into this source in Montréal, then the BANQ has you covered, having digitized Lovell’s Directory for an impressive 150 year run. 2. ↥ I learned about them from Carleton’s John Taylor when I took his urban history course in 2002. 3. ↥ I’ve abandoned fields due to an over-reliance on economic-indicators-as-ultimate-truth. 4. ↥ Which only makes rooming houses more of an issue. So I’m no prize either. 5. ↥ All lines are arbitrary, of course. There are a large number of two-unit apartments in the city, though at that point, you’re getting into a semantic argument. What separates two-unit apartment from a semi-detached home? Tenure? What happens when one side or level is owned and one is rented? There are different understandings that come from a building’s form. For example, a purpose-built triplex like the ones on Dagmar above will have a considerably different feel and communicate a very different meaning than three units in a large converted Centretown home will. This is all to say nothing about the back-to-back-with-a-common-hallway townhouses that began to appear in the 1960s and were, along with many garden homes, classified by Might’s as an apartment. Once I get to the 1975 list, the tower condominium will become an issue to wrestle with and I will have to make a call on housing tenure. 6. ↥ By the standards of the day, of course. We’re looking at 7-12 storey buildings. 7. 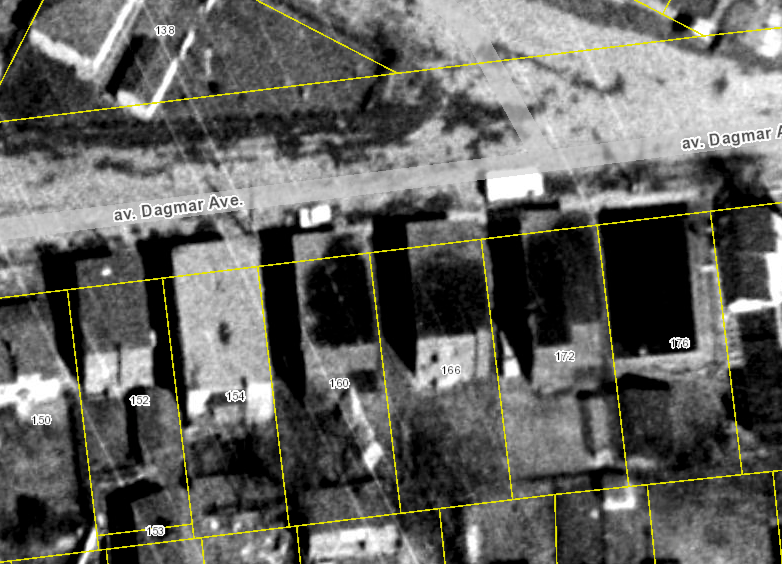 ↥ Nor where they found on my visual inspection of the 1965 aerials, and there were a rather large number of apartments that I located in the 1955 street directory that never did make it into the 1965 list of apartments. 8. ↥ Gareth Shaw. “Directories as sources in urban history: a review of British and Canadian material,” Urban History, Vol. 11 (May 1984): 40.